Save time, energy and life-sapping stress with this gloriously simple, clever and highly effective guide to painless and efficient decision making. This light-hearted and practical guide will help you turn your indecision into positive, assertive action. 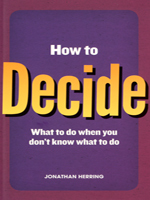 Guiding you through the entire decision making process, it is packed with clever tips and tricks to help you make the right decision, quickly, first time, every time. From work to buying a house; from choosing a holiday to choosing a partner; from the exciting and life-changing big decisions, to the more mundane little niggles that clutter everyday life – every type of decision is covered.